CNET reviewed Casio Exilim EX-Z1000 and wrote:" Slightly larger than a business card and less than an inch across, the camera weighs just six ounces with a battery and memory card. 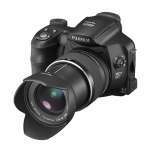 The Casio Exilim EX-Z1000 sports a simple interface with very few buttons. The direction pad controls all of the camera's functions; you browse a list of the most commonly used image settings without touching the system menu. These settings are easy to check and change, thanks to a panel on the right-hand side of the screen." "I was recently asked to photograph a local fireworks display. No problem, I thought, I love fireworks and I've shot enough of them to feel absolutely confident that I could provide the client with some great photographs. There was one twist however; because there was a need for a quick turnaround on a holiday weekend, the client asked that I use a digital camera." 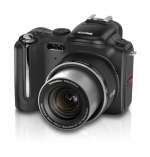 Digital Camera Review reviewed the Fujifilm Finepix F30 which is the successor to the popular FinePix F10 compact released last year. In it's press release Fujifilm stated: "The 6.3 MegaPixel FinePix F30 is the world's first point-and-shoot digital camera for consumers with full-resolution ISO equivalency speeds as high as 3200 - a setting previously reserved for advanced consumer and professional digital camera models. Higher light sensitivities allow the FinePix F30 to shoot with faster shutter speeds, which lessen the likelihood of blurry pictures caused by ever-active children, fidgety pets, dim ambient light or camera movement due to an unsteady hand." Fujifilm continues to make top-quality picture-taking a snap for consumers with today's introduction of the SLR-styled FinePix S6000fd, the first digital camera in Fujifilm's line-up with the company's new Face Detection Technology. Fuji Photo Film U.S.A, Inc. announced today the launch of the FinePix F20, the latest addition to its family of cameras with Real Photo Technology. Sitting alongside the multiple-award winning FinePix F30 in Fujifilm's high-end compact range, the FinePix F20 is an affordable digital camera for photo lovers who don't want to compromise on quality. With sensitivity levels of up to ISO 2000 and advanced Picture Stabilization technology, the FinePix F20 delivers detailed, natural looking photographs with little need for flash, even in very low light...without image blur. The advanced Face Detection Technology system built into Fujifilm's new FinePix S6000fd digital camera is based on the Image Intelligence technology found in Fujifilm's Frontier Digital Lab Systems, used by photofinishers to produce large volumes of top-quality photo prints. Face Detection is a selectable option the camera user can turn on whenever human subjects are the focal point of a picture. Eastman Kodak Company today announced the Kodak Easyshare P712 zoom digital camera, setting a new performance benchmark for the consumer â��superzoomâ�� category. Its precision auto-focus system with best-in-class click-to-capture rate - literally faster than the blink of an eye, at less than 1/10th of a second (0.07 seconds) - helps photographers get the exact shots they want, whether action on a sports field or children on the playground. The NV10 comes in an 18.5mm thin black aluminium body with Samsung's unique blue ring on its extendable lens barrel, and a pop-up flash. A 10.1 mega pixels, 1/1.8" CCD, not normally used in slim cameras, is used to give better detail - and the 230K, 2.5" wide-view LCD allows you to view brighter, clearer images. 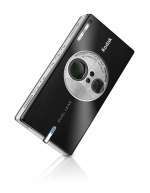 Eastman Kodak Company introduced the Kodak Easyshare V610 dual lens digital camera, the world smallest 10X (38 â�� 380 mm equiv.) optical zoom camera at less than an inch thick. Using innovative Kodak Retina Dual Lens technology, the sleek, pocket-size V610 camera precisely combines two Schneider-Kreuznach C-Variogon all-glass, non-protruding prism lenses to deliver such a long zoom range a first for a camera so small (just 4.4 x 2.2 x 0.9 inches). Nikon is pleased to announce an exclusive offer entitling customers to cashback on selected COOLPIX Life series compact cameras during 14th-16th July through selected national press. The Sigma Corporation is pleased to announce the launch of the new Macro 70mm F2.8 EX DG lens . This medium telephoto macro lens is ideal for both digital SLR cameras and 35mm film SLR cameras. The 70mm focal length gives an equivalent field of view as our popular 105mm macro lens when used on digital SLR cameras with an APS-C size image sensor. The desire for a more advanced photographic experience has been answered by the NV7 OPS, the first model of the NV Series. The 7.2 mega-pixel NV7 OPS with 1/2.5inch CCD and 7x optical zoom uses the ASR (Advanced Shake Reduction) system that is unique to Samsung, in addition to brand new OPS (Optical Picture Stabilization) technology for double anti-shake protection. These combined technologies enable you to take clear and natural pictures anywhere and in lower light conditions without using a flash. The NV3 is much more than a camera: it answers the needs of consumers who crave for more, combining a more luxurious design and practical multimedia technology. Accessories have also been enhanced. Nikon is pleased to announce the AF-S VR Micro-Nikkor 105mm f/2.8G IF-ED; the worldâ��s first macro lens equipped with Nikon Silent Wave Motor (SWM) and Vibration Reduction (VR) systems, specifically developed to meet customer demands. The new lens offers a host of Nikon's advanced optical features and technologies such as Nano Crystal Coating, Extra Low Dispersion (ED) glass and Internal Focusing (IF). The AF-S VR Micro-Nikkor 105mm f/2.8G IF-ED is engineered for use with both Nikon DX format digital and 35mm film SLR cameras. 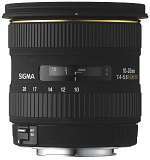 Sigma 10-20mm F4-5.6 EX DC HSM lens is awarded TIPA best consumer lens in Europe 2006. Sigma Corporation is pleased to announce the launch of the new 10-20mm F4-5.6 EX DC HSM lens. 10-20mm F4-5.6 EX DC HSM lens allows enjoyment of super wide-angle photography and it is a very powerful tool for indoor shooting and landscape photography with APS-C size image sensors of digital SLR cameras. 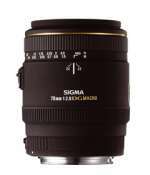 >>more about Sigma 10-20mm F4-5.6 EX DC HSM lens is awarded TIPA best consumer lens in Europe 2006. Nikon UK is pleased to announce the introduction of the D2xs professional digital SLR camera, following the success of the award-winning Nikon D2x. While the D2xs shares many features with its predecessor, the new model boasts an array of refinements that enhance performance and improve the user experience. Such features include, refined viewfinder performance; a new LCD with a 170-degree wide viewing angle; significantly increased battery life; and a wide range of firmware enhancements.